Just a half an hour drive north of Cádiz, Jerez de la Frontera, marks one of the three corners of the famed “sherry triangle”. (Sanlúcar de Barrameda and El Puerto de Santa María being the other two points). Sherry is a fascinating wine, coming in a wide range of styles from crisp, dry Manzanilla to sweet, rich Pedro Ximenez, so there really is a sherry for everyone, and it’s just a matter of trying until you discover the style for you! In this beautiful part of Southern Andalusia, we have prepared a day trip from Cadiz port which encompasses the essence of Jerez de la Frontera as a wine region and enables you to soak up its culture; the history, the food, the horses, with glimpses en-route of the striking landscape. A fantastic advantage in Jerez is that the wineries are in the historic center, allowing you to take in a number of “bodega” visits whilst meandering through the city itself. The wine appellation is Jerez/ Xérèz/ Sherry y Manzanilla de Sanlúcar- the longest name of any wine region in Spain. The word Sherry is thought to have originated in the 17th century, simply due to a mispronunciation of the word “Jerez” by British wine importers and the name stuck. 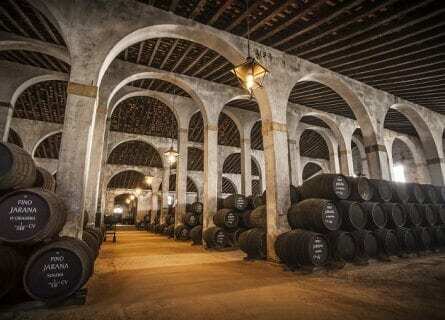 On this tour, you will visit two of the most renowned sherry Bodegas, enjoy a top-notch lunch paired with more of the fabulous Jerez wines and take time to stroll around the beautiful city. If you are looking for a luxurious excursion from Cádiz to nearby wine country, Jerez and adore trying local food and drink contact us for more information on this wonderful experience. 10 a.m. Your elegant chauffeur-driven Mercedes will collect you from Cádiz port and whisk you away for an unforgettable day in gorgeous Jerez de la Frontera. First stop is at the renowned Bodegas Rey Fernando de Castilla, this award-winning winery has been taking great pride in producing elegant and contemporary wines and brandies for over 40 years, with the family tradition of wine production flowing for over two centuries. This is a real treat for wine lovers and you will enjoy a VIP tour of the historic cellar followed by a special tasting of their mythical sherry wines and brandies. This is an exceptional tour and if you are not already a Sherry lover before the tour, you will be a Sherry convert by the end! Be prepared for a full morning as you will be expertly led through the fascinating and exquisite range, including; Amontillado Antique, Oloroso Antique, Palo Cortado Antique, Pedro Ximenez Antique, Fino Clásico, Vermut, and Brandy Solera Gran Reserva. 1:30 p.m. After this mouthwatering tasting, you will be famished and we have an exquisite lunch in store for you at the Villa Jerez restaurant. Your table awaits in the delightful garden, where you will savor elegantly presented regional dishes accompanied by cracking Jerez wines. Next, you will enjoy a VIP visit to the top cellar, Lustau. Founded in 1896, Lustau has one of the most beautiful bodegas in Jerez. You will have an extensive tasting of 12 wines, including some of their best wines such as Puerto Fino, Reserva Los Arcos Amontillado and the outrageously good Emperatriz Eugenia Oloroso. Before hitting the road you will have time to take in a walk of this special city and visit the Cathedral. Principally baroque in style, although you will notice the varying styles throughout as it was built over almost a 100 year period. It was only fairly recently raised to the dignity of Cathedral in 1980. 5:30 p.m. Your chauffeur will transfer you back to the port so that you can head back to your cruise. This concludes your spectacular tour of Jerez. We hope you’ve had a wonderful day! It was a real treat to see what opportunities await for a winery and where another’s success had already come to be realized. What we did love was when it came to the tasting – one of the winemakers was impressed with the selection of vintages arranged for our tour! Everything meet and exceeded our expectations!